Happy Friday! Yesterday I hosted a style event at my local Ann Taylor store with a few of my coworkers. I also purchased the Ann Cares card for an extra 25% off my full-price promotional purchase and I redeemed my $15 birthday coupon. The Ann Cares card is a $25 one time purchase for a great cause (90% of the proceeds goes towards BCRF) and it’s also a great deal if you plan to shop a lot in stores for spring and summer clothes now through May 14th. Yesterday I received 50% off plus an extra 25% off on top of that for a total savings of 62.5% off retail prices. 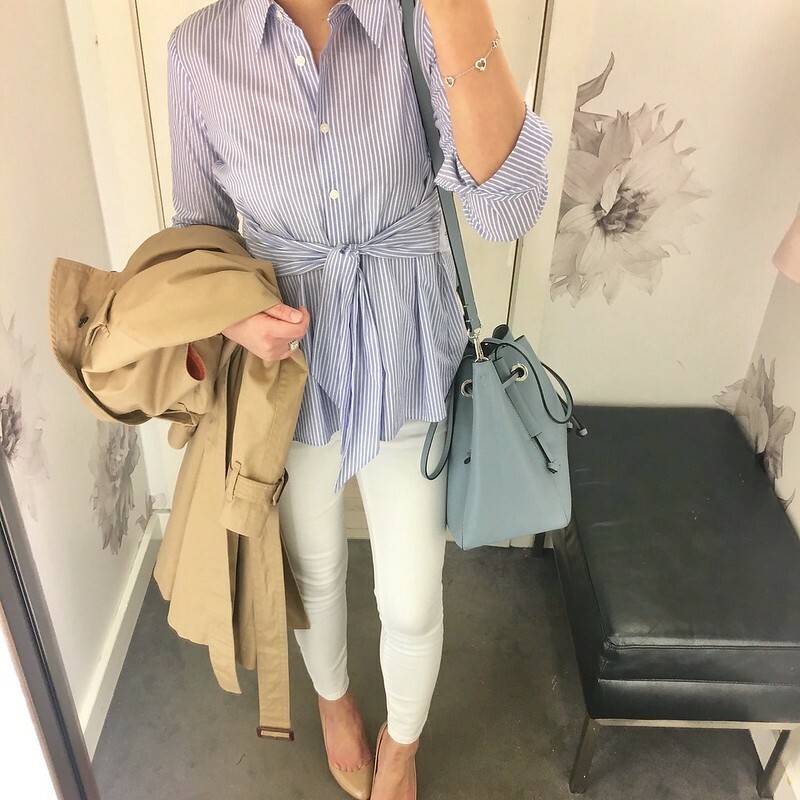 Refer to bullet point #10 of this blog post from a former employee to learn more about shopping and saving at Ann Taylor and LOFT with the Ann Cares card/St. Judes cards. J.Crew Sloane Patent Pumps – Thanks to @catmlrse for helping me find these new on Poshmark*! It’s been a while since the last 50% off that was valid in stores (end of December to be exact) and I was expecting a 40% off promotion since I was given a heads up in advance of our style event yesterday. Therefore, I was beyond excited when they changed the sale due to business needs and posted the sale early on Wednesday 4/12. Please check out all my recent Ann Taylor reviews. 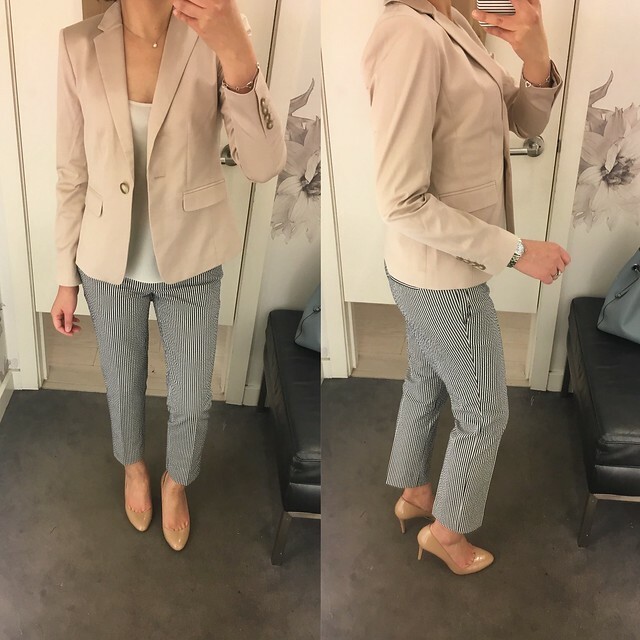 I bought this neutral blazer since this color will pair well over my tops and dresses. If you cuff the sleeves the lining is striped. The sleeves are bracelet length on me which I don’t mind for a summer blazer since I will likely cuff the sleeves and push them up when I wear it. I’d say that it fits true to size. The material isn’t too thick and it’s going to be the perfect layer at work since it’s perpetually chilly year round. Ann Taylor had a pant event recently but I wasn’t able to check it out due to having family in town. 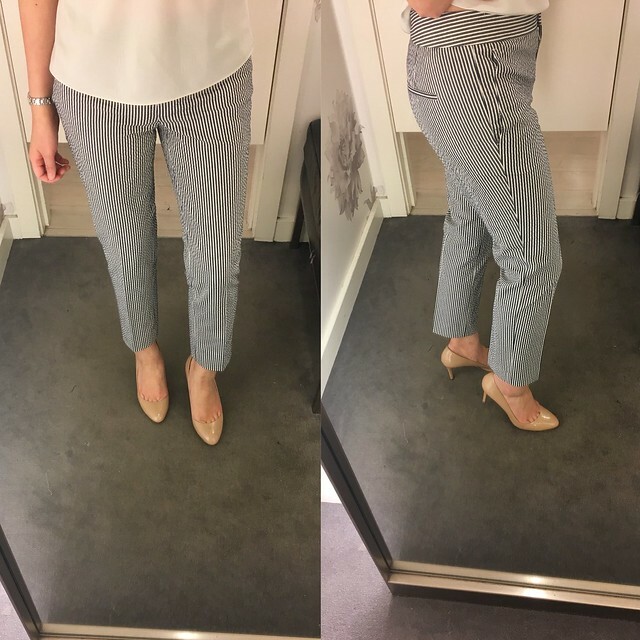 I love seersucker so I grabbed these pants to try on a whim and I like the Devin fit since I have a straight figure. They run one size bigger than my usual size at Ann Taylor so size 00P fit me well when I would have normally taken 0P. The ankle length inseam is also spot on for petites. Update 4/24/17: Get the matching blazer here. 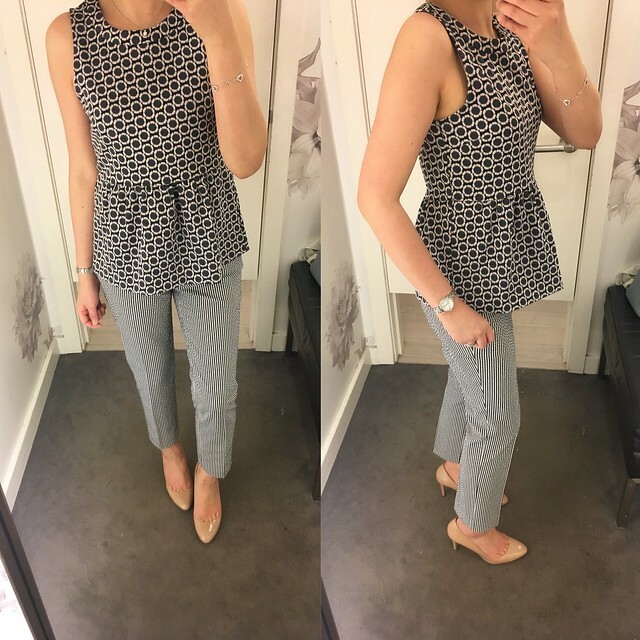 I got this peplum top in XS regular but I need this top in XXS regular or XSP for a better fit. I brought it home with me last night but I may exchange it for a smaller size if and when my size pops back in stock. I love the daisy print and it fits true to size but the arm holes of size XS regular are generous on me. The material has a good weight to it so it has some structure which causes the peplum flounce to stick out a bit from the side view. To be honest, I was having a case of hostess syndrome and I felt obligated to purchase something in store even though I had already placed an online order the day before. I was also testing the ‘pick up in store’ feature in my order which went smoothly by the way. Has anyone else tried this feature yet? Please provide feedback if you have any suggestions for them as they pilot this feature in select stores. I know I did. 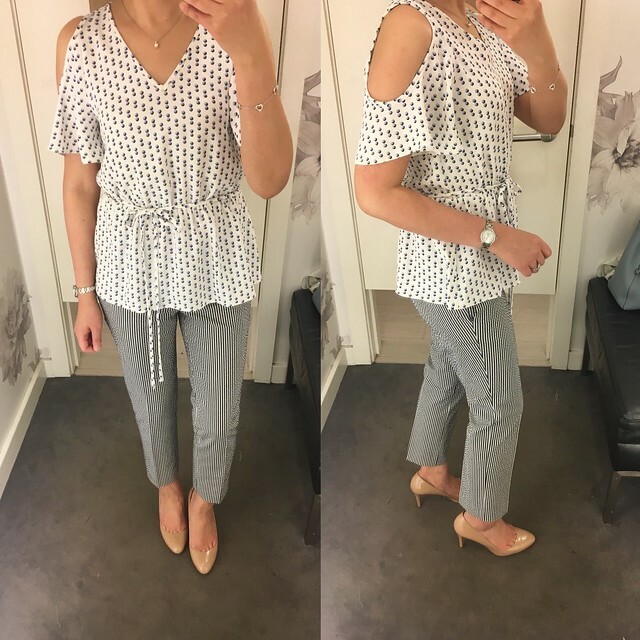 I love the print and style of this cold shoulder blouse as well as the thicker straps which allow you to wear a regular bra. Sadly for me, I have no waist definition so I had to pass on this cute top. One of my coworkers tried it on too and she has a curvy figure with a small waist so the top looked amazing on her. I found that it fits true to size. Lastly, I tried on this pretty fern print blouse in size XS regular since they didn’t have petites. The regular missy size is very long so tall ladies should be able to take this in regular missy while I definitely need it in petites for a shorter overall length. 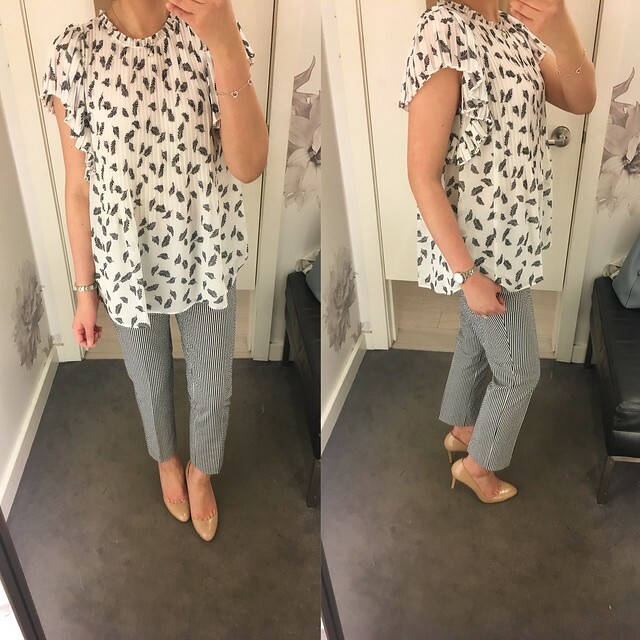 This top runs one to two sizes larger and I would recommend sizing down. My online True Fit profile recommended that I take size XXSP in this top. It is fully lined so it’s not see through and it’s also available in solid colors.